Note to self: Today is Saturday. invited me in to shop. Proof that the early bird does indeed get the vintage bird books. She was selling her parents' belongings and we got to chatting about how difficult that process can be and before I knew it, I had accumulated a small mountain of things to buy. The mountain of things all had 25 cent price tags with two exceptions: The 6’ vintage aluminum Christmas tree and the cardboard box filled with an entire farmer’s market of vintage chalkware fruit & vegetables. The Christmas tree and box of fruit were $3 each. There’s more I haven’t brought in from the car yet – some vintage suitcases, canning jars, polka dot Pyrex … I'd like to interpret this turn of events as a sign from the universe about the thrifting potential in 2011. Thank you, Nicest Woman Ever. Hope your estate sale went really well! Polka-dot pyrex?...be still my heart! Love the ornaments & I'm sure the vintage luggage is just fab. Nicest woman ever, indeed! You scored big girl! Perhaps this is a lesson to always show up a day early and act confused about the starting day.. luck and a nice woman were with you. $3 Christmas tree? You got the Aluminum Christmas tree for $3.00????? What an amazing score for being at the right place at the wrong time! Now that is truly serendipity. 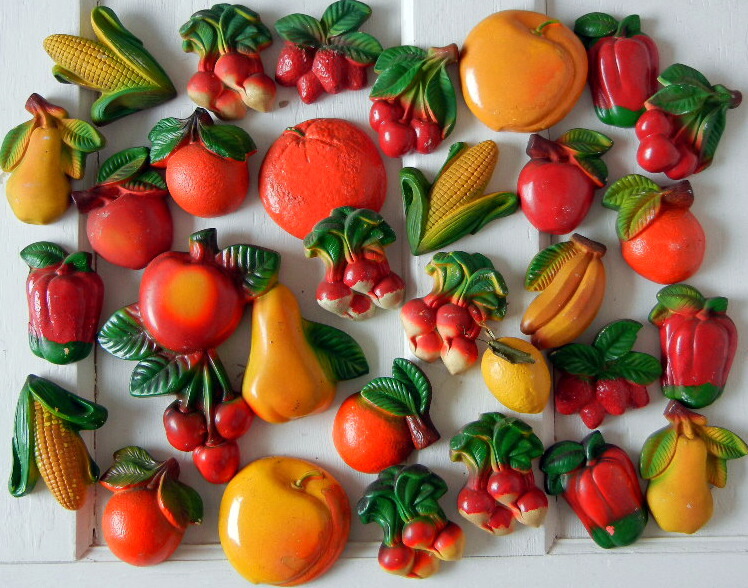 The chalkware fruit are amazing as well. This is the stuff that makes my thrifting little heart go pitter pat. Good job and lucky you!!!! OY......you don't even wanna know the expletives that just slipped out of my mouth over your $3 aluminum tree, vintage suitcases, and polka dot pyrex.......but rather than be a hater, I'll just congratulate you for what is obviously payback for the slim pickins on your recent road trip. Cheers Amy. You earned it! Good things happen to those who come early! WOW!!! You did super-great!!! 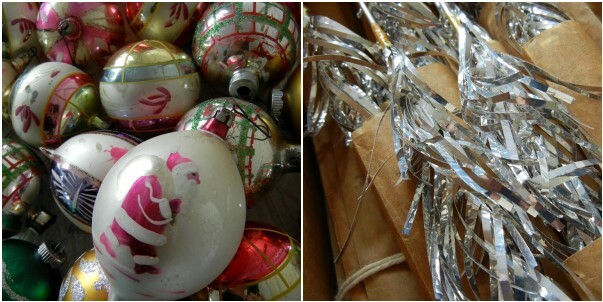 Christmas tree...Ornaments...Pyrex...WOW!!! Hmm, I'm gonna have to use that line... "yeah, I just drove thirty miles and I thought it was today...that's the ticket!" What a great stroke of serendipity for you! Love the tree, of course, and the suitcases and polka dot pyrex sound amazing! What a nice lady to let you in early! No doubt the universe is unfolding as it should! How nice of her to let you shop early, when she could have just sent you home. 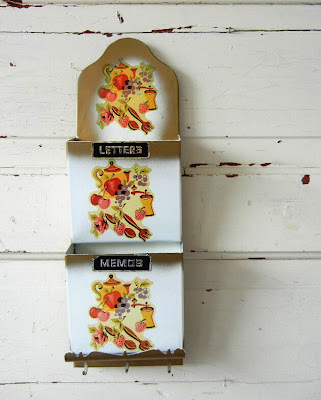 The letter holder at the top caught my eye, as I just got one similar (though in worse shape) on Friday. Mine has 4 compartments, worn gold edging & tattered decals, with one replaced but not matching). So, it's a little 'off' -- just like me, which is why I must like it! 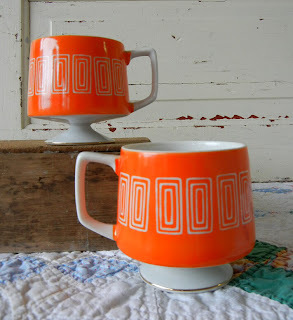 I am completely swooning over the orange mugs!!! Oh.My.Gosh. LOVE those birdie books and the chalkware. As Mike and Frank would say... The picking gods were with you!! My favorite kind of estate sale...done by the family who just want to get rid of things. I am amazed at the prices and warmed by the kindness of the woman. It's unbelievable how sometimes The Goods are right around the corner, just waiting for us. SWEET score, Friend! What a lucky duck you are!!!!! That's so funny! How nice of her to let you shop. You were able to find some amazing items. Did you just say polka.dot.Pyrex??? Nicest Woman Ever's parents sure had some great stuff. Are you hiding the stuff in your car, or are you using your vehicle as a rolling shed, like I do? Jealous, jealous, jealous, okay happy for you, still jealous. Did I mention I am drooling? Good for you. Excellent finds! How fabulous to have the place to yourself like that and how sweet of the nicest woman ever! Oooooh!! I don't think I would be able to pass up the letter holder or those 2 orange mugs either!! 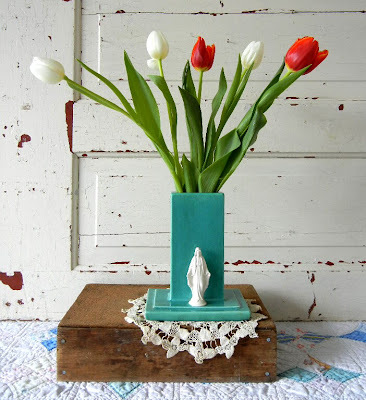 Pretty pretties....bless the nice lady! What luck, that was indeed very kind of her to allow you to come in and shop! She must have truly needed to rid herself of the excess clutter. Oh Amy how FANFREAKINFABULOUS....hahahahaha....That just wouldn't happen down here I'm afraid....!! 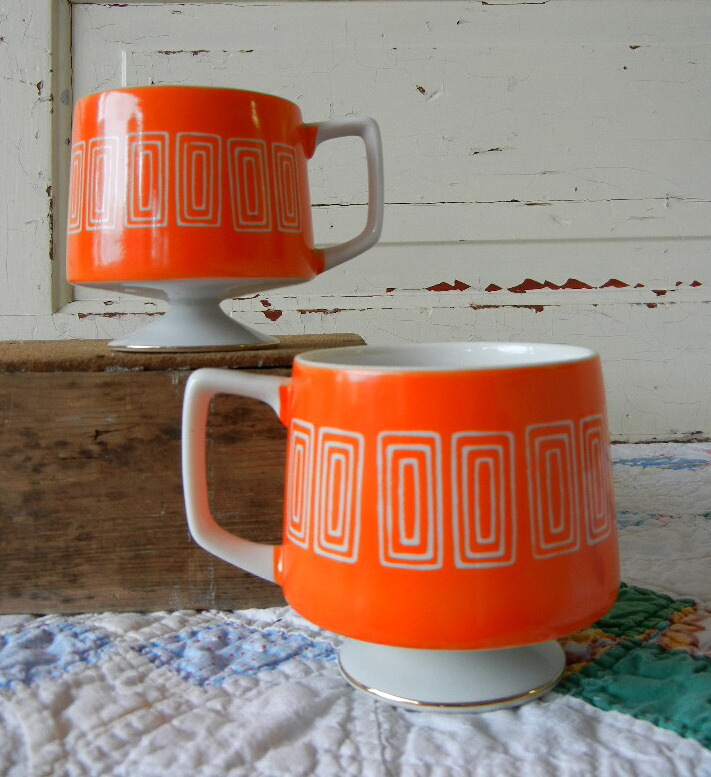 I LOVE the Treasures you scored....ESPECIALLY the vintage Christmas & orange cups....I feel the need to crank up Bing Crosby & flick through my Catherine Holm pics....! !